Lordy, lordy, look who's 40! G told me once that when he was a teen and he would see party decorations outside someone's home proclaiming this sentiment, he thought that was sooooo oldddddd and couldn't imagine being that age. Well, February 2nd (Groundhog Day and also Superbowl Sunday) that impossibility became his reality, and it was my goal to make the day as uplifting as possible. He has also told me that he never really got birthday parties growing up, and he had resigned himself to the probability that no one would remember him at all, besides me. It was sad and pathetic to listen to, and many times as he lamented his lonely fate I was tempted to blurt out the truth: I had been planning since mid-January to have a wee surprise party for him at his sister's house under the guise of a casual Super Bowl get-together. Our apartment is way too small for much company and I didn't really have the funds to take a big group of people out to eat or something like that. I really just wanted family to show up, share a cake, sing Happy Birthday, just to let him know that people cared. Nothing fancy or overblown, so sister K agreed to that arrangement. Since I have no interest whatsoever in football, I convinced him that I would attend the Super Bowl thing as a personal favor to him though I would certainly be bored, as "I really should be with you on your birthday". Selfless martyr that I am. I told him I'd make a cake and bring it just because we probably wouldn't finish one by ourselves. He bought it without question, but was a little confused when K asked us to show up a couple hours before the game started. She said it was because she wanted to get the cooking out of the way early, but really it was because it was a school night for his step-siblings' children, and the only way everyone could come was if it was early. Even so, it was actually easier than I expected! I used Dr. Jart Water Fuse BB Cream and Revlon Colorstay Concealer, Bare Escentuals Clear Radiance and Blush in Golden Gate on my face. I used Maybelline Color Whisper in Rose of Attraction on my lips. On my eyes, I used Bare Escentuals eyeshadow in Queen Tiffany on my lid (it's a beautiful sparkly warm brown shade), Inglot shade #12 (rusty reddish-brown) in my crease, and The Balm Mary Lou Manizer as my highlight. Mascara is Maybelline Volum' Express The Colossal Cat Eyes, and liner is Ulta Extreme Wear Gel Liner in Perfection. For his birthday cake, I made one of the first cakes I ever made when I was first teaching myself to bake years and years ago: a lemon meringue cake. Like the pie, but it's lemon cake, split into four layers and spread with lemon curd, and then piled high with meringue and baked until lightly browned. It's pretty spectacular and it turned out wonderfully, except his candles kept wanting to sink down into the meringue! There were lots of babies running around, and I think one of their heads photobombed my cake! When we showed up to K's house and opened the door, we were greeted with decorations and huge blown-up posters of G's face, which I hadn't been expecting, so I was surprised myself. Giant G became a patron saint of sorts, the way he seemed to watch over us, a bit creepily actually. I may or may not have abused Giant G in various ways during the course of the day; there may perhaps even be a shot of me picking Giant G's nose floating around. We had plenty of food including sandwiches, meatballs, my famous spinach dip, plus cake of course. The little kids made him big construction paper cards and we all sang to him. The day went really well and G was so happy and surprised! It did my heart good to see him so moved and thrilled by everything, especially when he was feeling down about turning the big 4-0. For his gift I bought him some clothes and also a Groupon for a chocolate and wine tasting at a local chocolate shop. We're going to use that for our Valentine's Day excursion this Friday, so I'm looking forward to that too. Hope you all are having a great week, and thanks for reading ! 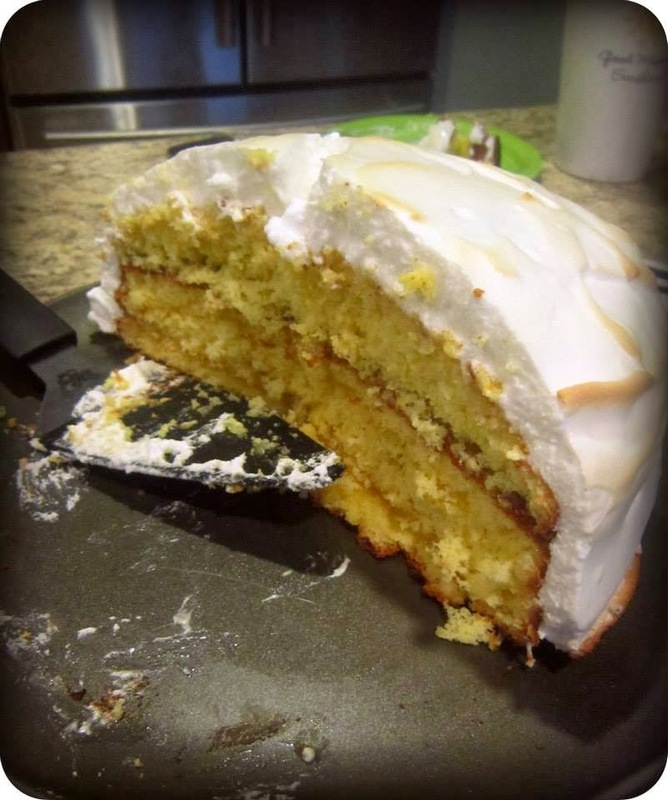 Lemon meringue cake sounds wonderful! Sounds he like had a fabulous birthday - and your LOTD turned out beautifully! I want to shove my whole face into that cake. Heh heh, yes, I was tempted as well. The cake look yummy, and I like your makeup look.